This effective metaphor conveys the precariousness and volatility that permeate the daily experiences of refugees. “Standing on one leg” implies the possibility of falling, but also the potential to move. It is a state of suspension, where every signal must be caught and decoded, because from that may depend safety and survival, for oneself, one’s family, one’s livelihood. Indeed, the idea of contingency was at the centre of my research proposal when I first came to Eastleigh, the Nairobi estate dubbed “Little Mogadishu” for the conspicuous presence of Somali people, either refugees or Kenyan citizens. I was thinking of the contingency which has been defining Somali mobility patterns since the Somali state collapsed in 1991. Yet, in the months ahead, the concept acquired a dramatic actuality. Indeed, these are tough times for Somali refugees in Kenya. Since the Kenyan government became embroiled in the Somali conflict in 2011, the whole Somali community in the country (encompassing both Somali Kenyans and refugees) has been increasingly portrayed by politicians and media alike as a potential fifth column of Al-Shabaab, an Al-Qaeda affiliated Somali organization. After invading Southern Somalia, officially to prevent terrorist infiltrations, Kenya has conjured up the very demon it aimed to exorcise: a spat of terror attacks (culminating with the raid of Al-Shabaab gunmen in Nairobi’s Westgate shopping mall in September 2013) that has shed blood and triggered ethnic profiling, and given free rein to corrupt police to abuse and extort money from refugees. Refugee mobility has increasingly been restricted to camps and a massive security swoop, operation “Usalama Watch,” has lead to round ups and deportations to Somalia. Many, particularly the youth, are moving to Uganda, where a progressive refugee act allows refugees to circulate freely. Financial practices have a crucial role in decision-making strategies against this volatile background. The long-established hawala system enables businessmen to move capital to new areas where trade opportunities are flourishing, such as Kampala, Kigali in Rwanda, the DRC border and, until recently, Juba in South Sudan. At the same time, the usage of Safaricom M-Pesa mobile money across borders facilitates the transfer of small amounts to sustain students and small businesses between Kenya and Uganda. The way the two infrastructures are used and interwoven reflects the importance of cultivating multiple financial options to respond to unpredictable situations. The story of Abdiqadir Cali is a vivid example of how this combination occurs in practice. I first met him in the Bangkok mall, one of the many trade centres that are the landmarks of Eastleigh. He was 26 years old, had a refugee card and a reputation as a computer wizard. He had flown to Kenya in 2009 after the Islamist militias of Al Shabab had captured the city of Baidoa, in Bay region, Southern Somalia, where he was born and where his family still lives. He spent a few months in his cousins’ house in Mandera, on the Kenyan side of the border, and then, driven by the desire to get formal education, moved to Eastleigh. Once again, some relatives offered him hospitality and a little financial help with which he enrolled in a technical institute. After a year, though, his funding dried up and he was forced to withdraw. Yet, he had discovered that he was particularly talented in resurrecting laptops and computers. “Let’s ask Abdi” became the immediate reaction to a crashed system, and his name – and mobile number – started travelling via word-to-mouth or SMS. It thus spread outside Eastleigh, Nairobi and eventually Kenya, spurring a flood a job offers from as far as Mombasa and Kampala. His customers were mostly Somalis and a few Kenyans and Arabs from the coast, all wanting him to fix their apparently dead devices, packed and shipped by bus to Eastleigh. Abdiqadir Cali became busy dismantling and reassembling laptops and PCs, constantly informing his customers about this or that spare part to purchase, payment upfront. 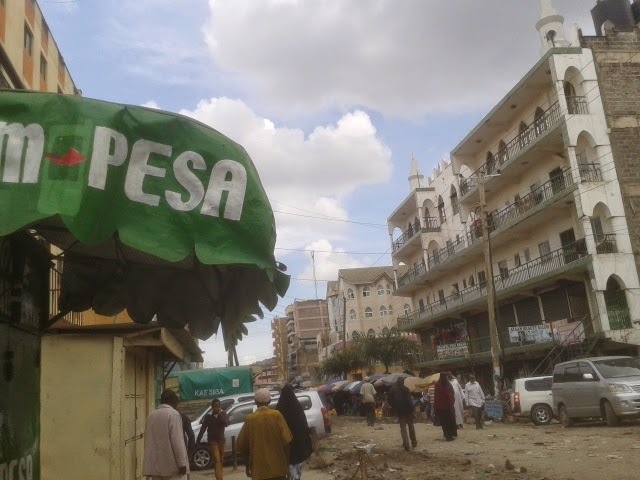 The money was sent through M-Pesa and Abdiqadir Cali used his mobile phone as a wallet, through which he received payments and where he stored his monthly allowance. In fact, he had his savings somewhere else: each month, he transferred a sum to his family back in Baidoa using Dahabshiil, a major hawala company. He thus converted the KSh received through M-Pesa in USD and deposited the amount in a local branch of Dahabshiil, which made it immediately available to the designated recipient in Baidoa. “I keep tab of my transfers and my mother takes care of my money”, he said. “One day, I will use it to start a business.” In the meantime, though, his savings were shoring up his family’s livelihood and fostering his siblings’ mobility aspirations: one of them was set to move to Kampala, tapping into his older brother’s little wealth to fund his journey. I got in touch with him after the Kenyan police launched the crackdown. He told me that he had been arrested by the police and forced to pay the equivalent of 50 USD to avoid deportation to the Daadab refugee complex. Now, he was planning to follow his brother to Kampala, where in recent years a new Little Mogadishu has grown in the slum of Kisenyi. He was confident that in Uganda he would be able to rely on his hawala account and even to expand his customer base in the country and in neighbouring countries. Read more in Gianluca Iazzolino's final report, "Contingency Routes: Somali Flows and Transnational Spaces between Kenya and Uganda."